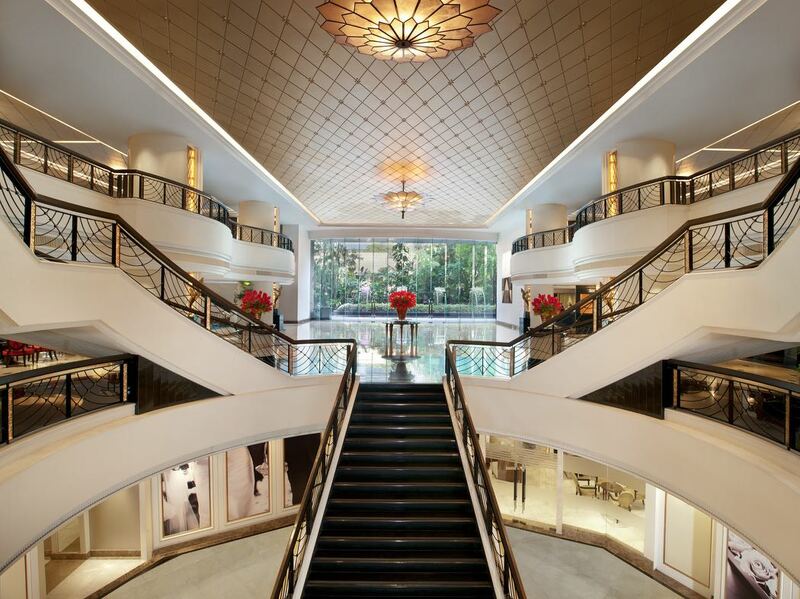 The beautifully designed Plaza Athénée boasts an enviable position on the site of a former palace in the centre of Bangkok, close to great shopping, restaurants, and Lumpini Park – a rare area of green space in the heart of this vibrant, exciting travel destination. It’s also just a few minutes’ walk from the nearest BTS sky train station, which is a great way to get around the rest of the city and explore the many delights it has to offer, from the hustle and bustle of modern city life to fascinating traditional markets and beautiful ancient temples. 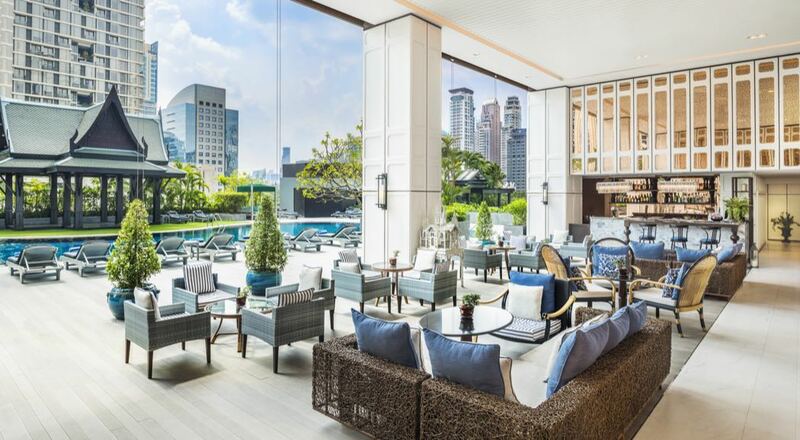 Add luxury accommodation and first rate facilities into the mix, and it isn’t hard to see why the Plaza Athénée is such a popular choice for a city break in Bangkok. Thai, British Airways and EVA Air all offer direct flights to from London Heathrow, while the hotel is around half an hour’s drive from the airport. Whether you’re travelling for business or pleasure, you’ll find everything you’re looking for at the Plaza Athénée. The friendly staff will make you feel at home from the moment you step inside, while the classic yet opulent décor is sure to appeal. Rooms and suites come well equipped with every modern comfort you could wish for, and with the lagoon style swimming pool, wide choice of restaurants and a spa and fitness centre, you’ll certainly not be disappointed with the facilities here. The business traveller is equally well provided for, with excellent meeting rooms and a business centre at your disposal. Recently re-modelled, the rooms at the Plaza Athénée combine up to the minute facilities with elegant, award winning Thai colonial décor. Rooms feature either king size or double beds, with king rooms also benefitting from a contemporary Thai sofa. All rooms have a work desk with ergonomic chair, a 48 inch LED TV, tea and coffee making facilities, high speed internet access and 24 hour room service. Bathrooms are spacious and boast separate bathtubs and walk-in rain showers. 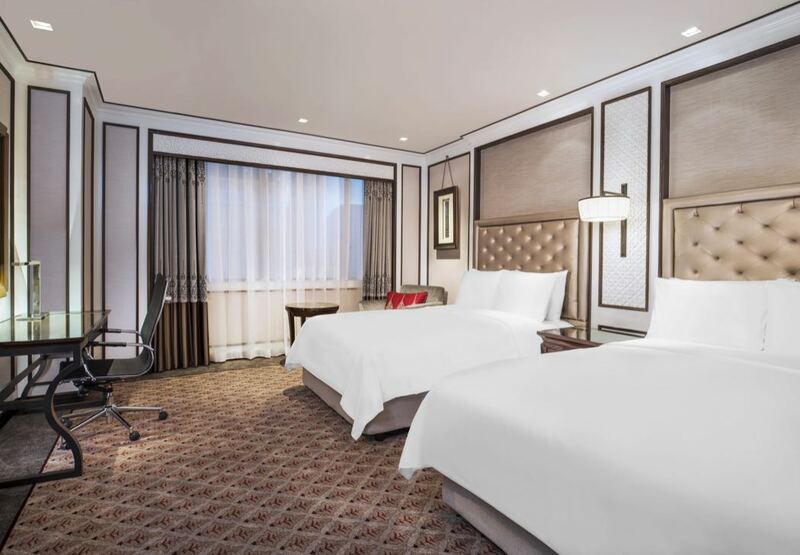 In addition to regular rooms, there are some fabulous suites to choose from, including the Athénée suites, which enjoy breathtaking cityscape views. 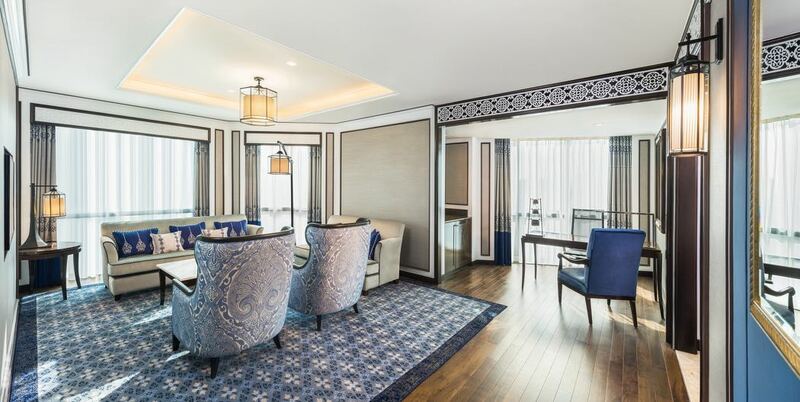 These rooms are also beautifully decorated with traditional Thai artefacts and luxurious touches such as silk wall panels and crystal chandeliers. Room Tips – Suites are well worth spending that little bit more on, while if you want a stunning view of Bangkok, opt for a poolside room. 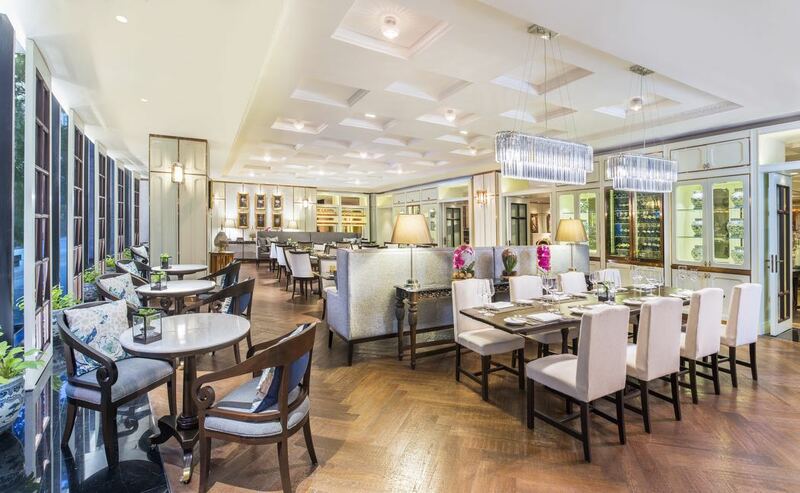 From the huge buffet selection at The Rain Tree Café to fine dining at modern French Restaurant The Reflexions, there really is something for everyone when it comes to food and drink at the Plaza Athénée. You can also sample authentic Cantonese cuisine, Thai curries and Japanese sushi in some of the other in-house restaurants. The glamorous Glaz Bar is the perfect place to enjoy a cocktail or a glass of champagne, or you can relax with sandwiches, snacks and drinks at the View, located right by the pool. The hotel also boasts The Bakery, overlooking the leafy Wireless Road outside, where you can indulge in tea and delicious pastries. The lagoon style pool, located on the rooftop of the hotel with spectacular views of Bangkok and surrounded by tropical gardens, is one of the most beautiful features of the Plaza Athénée. There is also a spa, offering massage and facial treatments inspired by French skincare wisdom, and a state of the art gym. 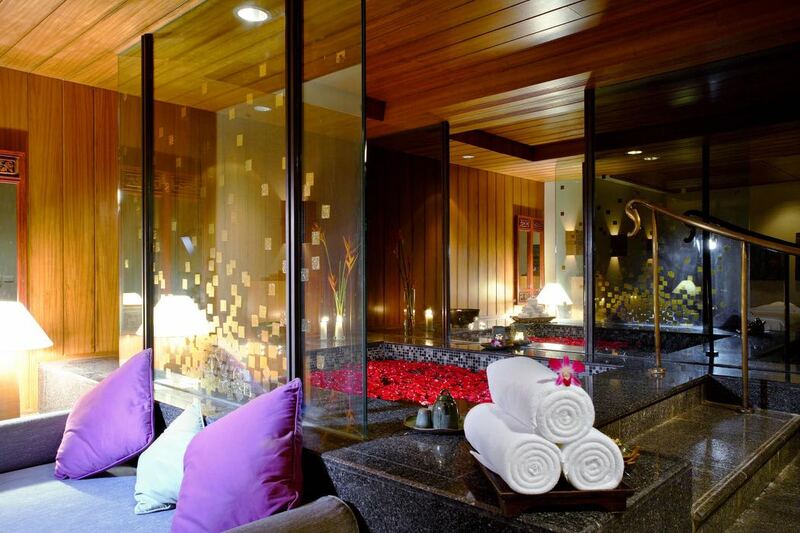 With the hotel located in the heart of the city, all Bangkok’s many attractions are well within reach. The hotel is ideally located in terms of public transport links, and the sky train is one of the best ways to get around the city. However, if you do plan on taking taxis or hiring a car, make sure you plan for lots of traffic. The Plaza Athénée is a beautiful luxury hotel with a great city centre location, making it the perfect base from which to explore Bangkok.